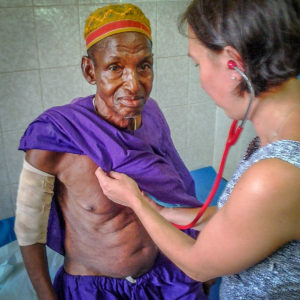 Abdulai Jalloh, 65, was struck by a motorcyclist about four months ago in Sierra Leone, leaving his upper-left arm fractured and with no hope of healing since the bone ends did not line up or touch each other. On November 5 Abdulai was seen by a German orthopedic surgical team, Ortopaedie-Fuer-die-Dritte-Welte, visiting Sierra Leone. They determined that a metal plate could be implanted to mend the fracture. Shown here being assessed by an anesthesiologist from the team, Abdulai could not stop thanking everybody. The surgery was completed November 6, with funding from Africa Surgery, and this will enable him to once again use his left hand and arm.